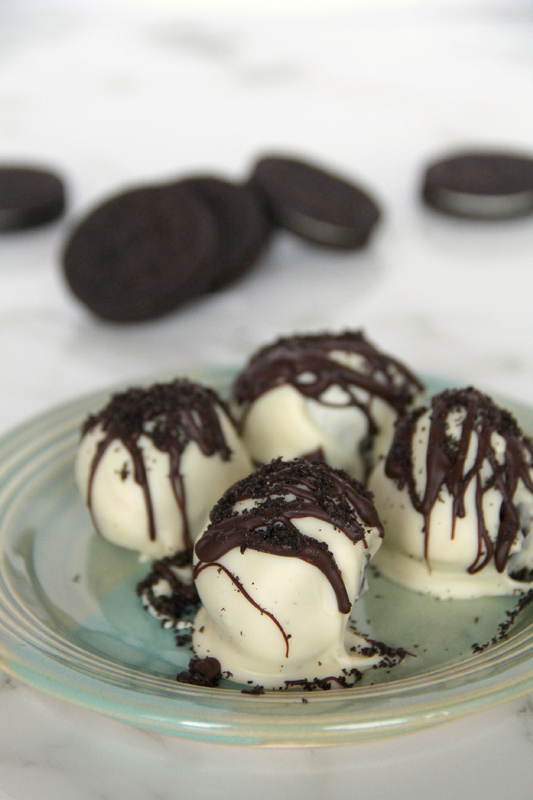 Oreo Balls made with cream cheese, oreos, and white or dark chocolate are a family favorite and a great way to get kids involved in the kitchen! Isn’t it funny how sometimes the simplest things can bring the most joy? 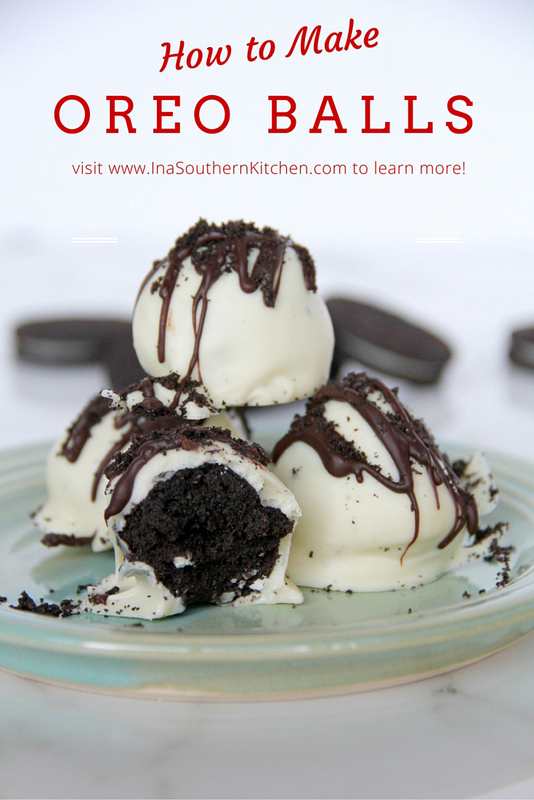 These oreo balls, for example, are one of the easiest desserts you can make but they are also one of the most beloved and as soon as anyone sees them a great big grin breaks across their face. 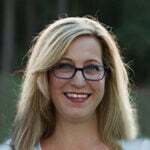 For those of us who love to cook, that smile of delight and anticipation is what we live for. Many of my best childhood memories center around the kitchen, either with my Granny, my mother, or my great-grandmother and many of those occasions were spent preparing food for someone else. 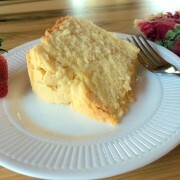 This Cream Cheese Pound Cake is my go-to for any occasion that calls for delivering food to a friend! I cook and share food because it’s how I love my people. Nothing brings me greater joy than to feed the ones I love. And it’s always my first instinct of how to be present for someone. Something good happens, I’m going to bring you food to celebrate. Something bad happens, I’m going to bring you food to commiserate. It’s just what we Southern cooks do. 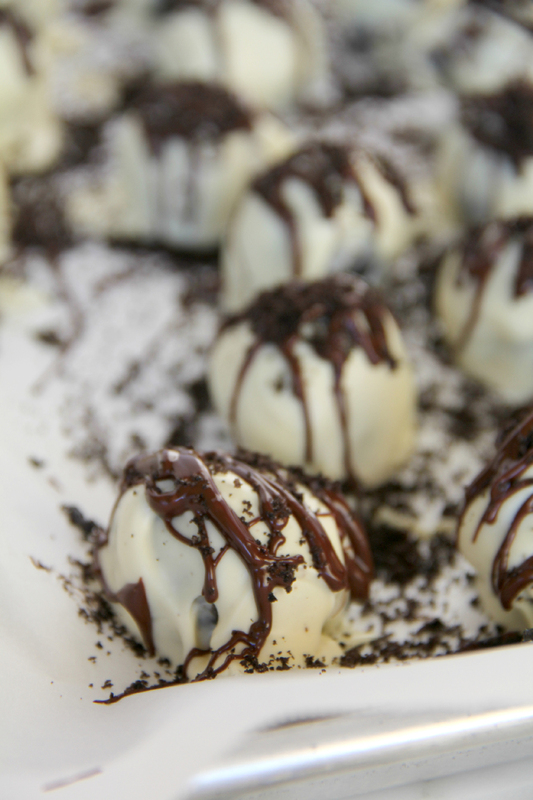 When Casey was in high school, the mom of one of his friends used to make these Oreo balls frequently and he devoured them every time he was at their house. So when he broke his collarbone and had to sit out almost the entire lacrosse season, the next day a batch of these Oreo balls made its way to our front door. And a few months later, when he broke his wrist and had to sit out the entire summer season, Mrs. Tammy brought more Oreo balls. (And Mrs. Rita brought his favorite cheese grits.) They didn’t heal any bones or change any circumstances, but for a brief moment they brought a smile to a sad young man’s face. And that’s what cooking is all about. You can’t make a cake and change the world, but you just might bring a moment of joy to someone’s day. 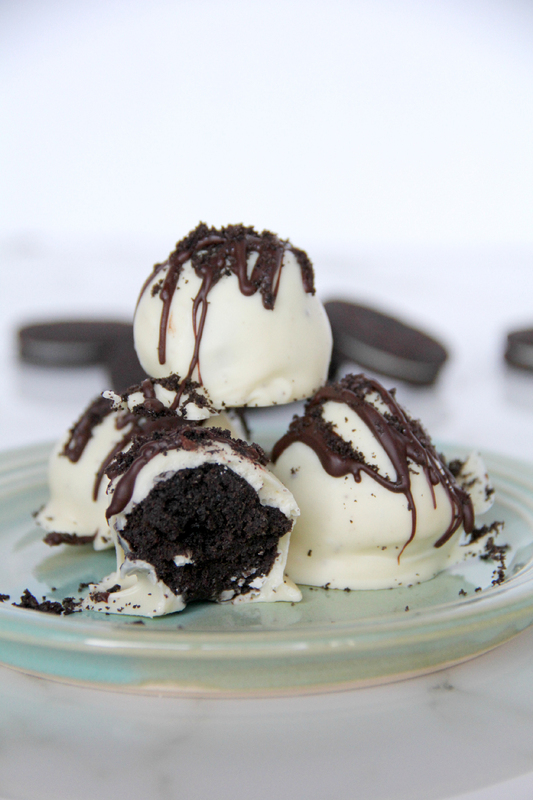 These Oreo Balls, also known as Oreo Truffles, are a Kraft original recipe and you can find many variations on the Internet. I usually keep them simple and just dip in white chocolate with a semi-sweet drizzle on top. You can also dip in semi-sweet chocolate. The possibilities are endless! 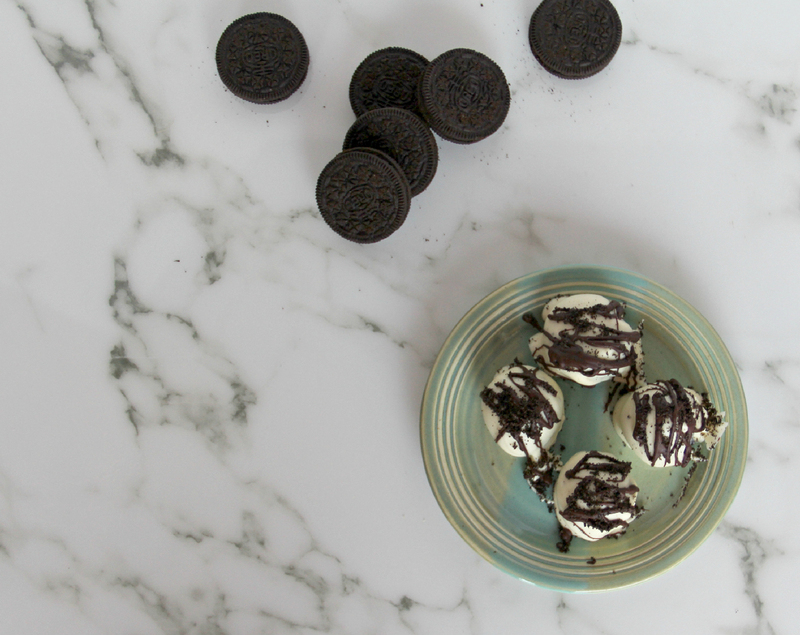 Crushed Oreos mixed with cream cheese and dipped in white chocolate--easy and a family favorite! Place cookies in bowl of food processor and pulse until finely ground. Scoop out 1/4 cup of the crumbs and reserve for topping. Add cream cheese in chunks to the food processor and pulse until well blended with cookie crumbs. Roll mixture into one-inch balls and place on prepared baking sheets. You may find it helpful to chill the dough for a few minutes before rolling. After rolling the balls, place the baking sheets in the freezer for half an hour to an hour. Melt the white chocolate and the semi-sweet chocolate according to package directions. Allow to cool slightly, just so it is not hot but not enough to set. Remove balls from freezer one tray at a time and place one ball in the melted chocolate. Using a fork, gently stir the ball around to coat then lift with the fork, tap to drop the excess chocolate, and place the ball back on the baking sheet. Drizzle with semi-sweet chocolate and sprinkle with crumbs while the balls are still wet from dipping. Once all the balls are dipped, drizzled, and sprinkled, place the trays back in the freezer for about 15 minutes to set. Store the Oreo balls in the refrigerator for several days (ha! they will not last several days but it sounds good!) or secretly store in the freezer for 2-3 months.